﻿Breakfast is big business. I don't like getting out of bed, but I do like to go out for breakfast. I got this recipe courtesy of Whole Foods and decided I would try to make a gourmet pancake of my own. ﻿And since it was my personal gourmet pancake, I did not put in any raisins. In a large bowl whisk together mix and cinnamon. Add milk and oil (1T) and whisk until combined. Stir in pineapple, carrots and pecans until well combined. Use 1/4 cup measuring cup to portion your pancakes. Cook on skillet over medium heat until golden brown on the bottom (use your normal pancake technique of seeing it bubble first), then flip. Batter will make 8-9 pancakes. 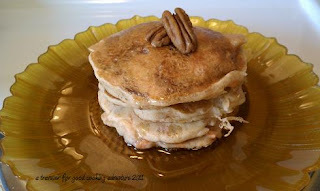 I served these with maple syrup, but the crushed pineapple is another option.